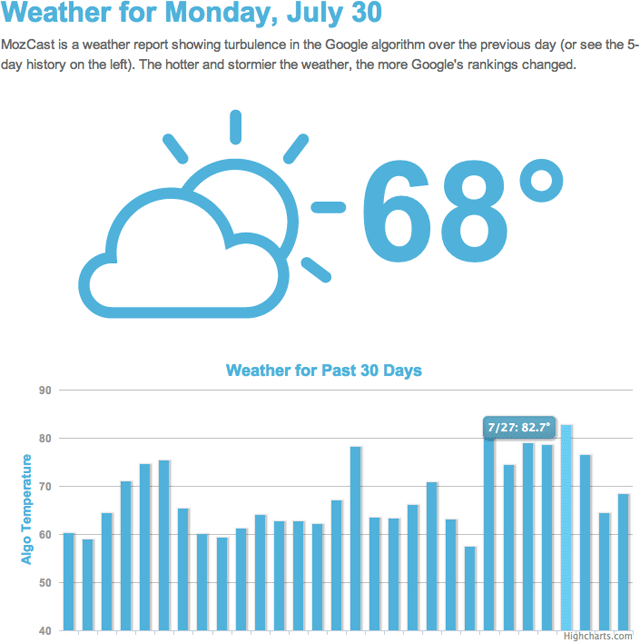 Dr. Pete at SEOmoz announced they introduced a new tool to try to track the daily fluctuations at Google in weather report style. This is meant to try to help the SEO community figure out if their site dropped or climbed and no one elses did or if they are in good company. This is what I do here, by tracking the forums and looking for noise when I report on Google updates mostly before Google confirms them. It is important because rankings are constantly changing but sometimes only a small percentage of sites are impacted and sometimes it is much larger. Knowing if it is a major algorithmic change, a bug or something specific with their site gives SEOs the tools to make the changes necessary to compete in the Google search results. That being said, I always took a human approach to watching the forums, seeing the complaints and then using my own judgement to determine if it is a large algorithmic change or just individual complaints. I am not always right, far from it, but I am pretty close. Over the past few months, Dr. Pete at SEOmoz was testing this tool with me and they finally released it at MozCast.com. It is updated around 10:30am EDT every morning for the previous day's rankings. So it is technically about a day behind the reports I would provide here. But it is a great test for both of us to compare my human findings and his algorithmic findings. As you can see, there is a chart on the bottom of the page as well that shows historical changes. They also place significant changes by hand on this page. How do they do this? Every 24 hours, we track a hand-picked set of 1,000 keywords and grab the top 10 Google organic results. Keywords were deliberately chosen to avoid obvious local intent, are distributed evenly across 5 "bins" by query volume, and are tracked at roughly the same time every day from the same location. In other words, we do our best to keep the data set tightly controlled. Each day, we take the current top 10 and compare it to the previous day's top 10 (for any given keyword), and calculate a rate of change or "delta". Specifically, we use two metrics – called Delta 100 and Delta10 – which measure the change across the entire set of top 10 results. Then, we crunch Delta10 across all 1,000 keywords and multiply the resulting average by a fixed multiplier (currently, 28.0) to produce something that looks like a temperature (in °F). An average day is about 70°F. SEOmoz is not the only one doing this. SERPmetrics has been doing this for ages. They even provide some alerts on Twitter. Of course, SEOmoz's version is prettier. So now we have a few tools to track Google updates. MozCast, SERPmetrics and me. Forum discussion at Inbound.org & Google+.